HOT columnist Sean O’Shea interviews Ken Edwards about his song writing and other writing interests, his views on the role of the writer and his publishing company Reality Street. 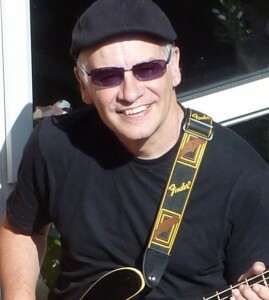 Ken is a man of many talents but is probably best known locally as lead singer and bass guitarist in The Moors, one of Hastings’ edgiest and most popular local bands. Sean O’Shea: You were born in Gibraltar and studied at Kings College London in 1968 while the students were occupying the universities and taking to the streets in Paris. What was it like living through those times? Ken Edwards: I wasn’t much of a student radical, in fact I felt quite intimidated by some of the heavyweight politicos (mostly over the road from King’s, at the LSE). I remember the late 60s mainly for the amazing cultural upheaval, particularly in the areas I was interested in, music and writing. It seemed like everything was possible then. I also reflect now on how privileged I was getting a grant to study free for three years – how different from students today. Sean O’Shea: What drew you to Hastings? Ken Edwards: My wife Elaine and I have a short answer and a long answer to the “Why Hastings?” question. The long answer might take the space of a novel. The short answer is we were looking to escape London (I’d been there 35 years), wanted to live on the coast, Brighton was too expensive, but we loved Hastings Old Town: friendly, vibrant, close to the sea and the magnificent Country Park, good food, good music. Paradise! Sean O’Shea: As well as being a musician you are a writer of songs, of fiction, essays and poetry and an editor and publisher. Does a particular role dominate and which do you enjoy most? Ken Edwards: I think of myself as a writer first and foremost. But I’ve always been passionately interested in music, and involved in various musical projects over the years. Now, belatedly, that side is coming to the fore. Sean O’Shea: You run a publishing company called Reality Street, how is this venture developing. Ken Edwards: Reality Street started in 1993, though I had been involved with poetry magazines before then. It is an attempt to provide a context for the writing I’m interested in, and to create a community of readers and writers. It publishes what most people would think is pretty left-field stuff, though it feels normal to me. It is a very small operation, and hardly makes any money, but that’s not the point of it. Sean O’Shea: Calling Me Home is one of your songs from the recent Moors CD, would you like to tell us the background to this song and how you came to write it? The tune is “Zvonija Zvonija” by the late great Balkan Gypsy singer Lilijana Buttler, with English lyrics. This song was Lilijana Buttler’s big hit in Bosnia and Serbia a few years ago. She died in 2011. I transcribed the tune for The Moors to play, but we couldn’t understand the Romany words. So I wrote my own. What I did was to use as inspiration an existing poem I’d written many years ago at the time of the Bosnian conflict. I’ll reproduce it here if I may. It’s probably self-evident from this what the differences between a poem and a song are. The reference to the wedding ring “on the wrong finger” is to the custom in that part of the world of wearing the wedding ring on the right-hand ring finger during the engagement. Anyway, after I’d learnt to sing it and we’d performed it a few times, I discovered what the original words were. They were quite simple: about celebrating Gypsy heritage and family and having a good time. I couldn’t have made a credible direct translation, but I hope my lyrics are in the spirit of the original. Dragi Sestic, the original co-writer, was happy for us to use our version on The Moors album. Sean O’Shea: Let’s talk a bit about the process of song writing. Leonard Cohen for example agonizes over songs and does a lot of rewriting, while Dylan seemed to knock songs off at speed. What’s your approach? Ken Edwards: A friend told me they’d met a bass player who had been asked to play on a Dylan album a few years ago. He was booked into a hotel, turned up at the studio, all the musicians were there, but Dylan hardly had half a song ready. They went out to dinner and Dylan was very quiet during the general conversation, spending most of the evening writing in a notebook, apparently inspired by what people were saying. Next day, back in the studio, there were twelve songs ready to go. I don’t know how true that is. I tend more towards the Leonard Cohen way of doing things. Sean O’Shea: Have you any tips for the aspiring songwriter? Ken Edwards: I would feel presumptuous doing so. I suppose the same applies to any kind of writing, though: listen to a lot of stuff, try to emulate what you really like, and you may eventually come out with something original that’s never been done before. Sean O’Shea: You have written a number of novels. Which of these would you recommend to someone unfamiliar with your work and why? Ken Edwards: It’s true I’ve written a lot of fiction, much of it unpublished. Most of my published books are poetry. My most accessible novel is Futures (published in 1998). Last year I had a little book out called Bardo, which is a kind of rewrite of The Tibetan Book of the Dead, with Hastings Old Town as its backdrop! Sean O’Shea: James Joyce regarded the writer/artist as a kind of omnipotent god-like figure who remains above his handiwork pairing his fingernails. Samuel Becket by contrast described himself as working with impotence and seemed to regard writing as an impossible task, a kind of affliction imposed on him perhaps as a punishment. What’s your view of the writer’s role? Ken Edwards: Well, Beckett is like a god to me. Recently I turned up a collection of his late, experimental prose and started reading it again. Nothing like that would be published by any commercial publishing house today. For me, it’s important to venture into the unknown. That’s the essence of creativity. To create something that wasn’t there before. Sean O’Shea: Freud developed a talking cure; do you think there is such a thing as a writing cure and if so what ailment might it cure? Ken Edwards: The ailment of life! Sean O’Shea: Thank you for agreeing to be interviewed by HOT. Ken Edwards is reading his poetry at the Black Huts Poetry & Film Festival, taking place at various venues in Hastings (Electric Palace, Jerwood, The Beacon), 2-4 November.